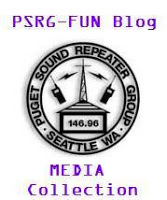 With material help from Randy (W3RWN) and labor from Casey (AE7SL), the Puget Sound Repeater Group has installed its test DMR repeater at Capitol Park. This repeater is linked to and carries the core PNW-DMR (Pacific NorthWest DMR Group) talkgroups. Click this link to access the PSRG Digital Dashboard. For more information on the PNW-DMR network, please visit their website pnwdigital.net* for details on talkgroups, user technical guidelines, and operating best practices. If you are going to operate DMR in this region, please join the PNW-DMR notification group so you can receive operational notifications and be informed of network changes. If you have not operated DMR before, please take some time to read some of the information for first time users before keying up. Also, Bob Stephens AF9W presented “An Introduction to DMR” at the 2019 Annual Meeting. Copies of his slides can be found by clicking the above link. Finally, the PSRG Wiki includes a link to Tim WT1IM’s DMR Cheet Sheet.